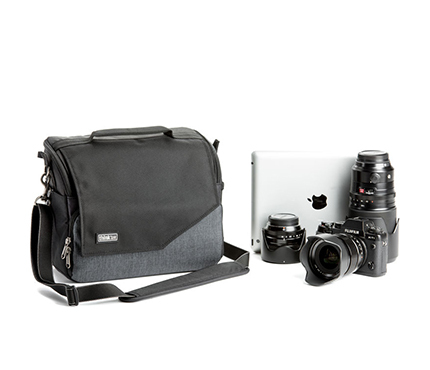 The pewter Think Tank Mirrorless Mover 30i is a shoulder bag that can hold a mirrorless camera with two to four lenses and accessories, or a small DSLR with one to three lenses plus accessories. The main compartment has a zippered closure and two removable padded dividers for customizing the interior. One of the dividers has a slot in it for holding a phone or similarly sized accessory. There is also a dedicated slot to hold an iPad or other 10'' tablet. A flip-top lid folds over the main compartment and fastens onto the front accessory pocket via a magnetic closure. The bag can be carried by the top handle, worn over your shoulder with an adjustable strap, or worn on a pant belt using the rear pass-through slot. It can also be worn as a backpack by using an optional Shoulder Harness V2.0. 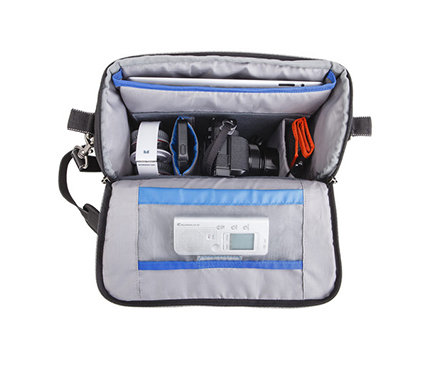 Stretchable side pockets and an interior mesh pocket can hold accessories such as memory cards, batteries, or the included seam-sealed rain cover. Phone slot in padded divider. 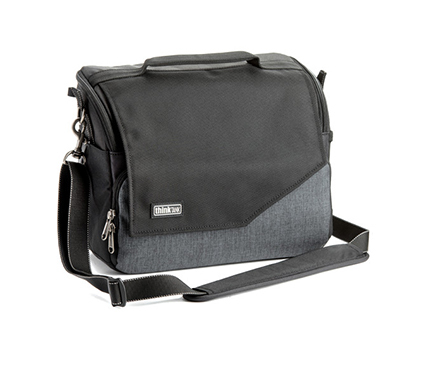 Removable shoulder strap easily converts the bag to a belt pack or hand bag. Rear pass-through slot allows you to wear the Mirrorless Mover on your own pant belt or on a Think Tank Photo Pro Speed or Thin Skin belt. Easily accessible front zippered pocket for accessories. Stretchable and gusseted side pockets for accessories. Internal mesh pocket on the lid for a battery or other compact accessories. Grab handle on the lid. Poly ballistic fabric ensures durability and protection from the elements. MAIN MATERIAL Exterior : 1680D ballistic polyester, 600D brushed polyester, nickel-plated metal hardware, and 3-ply bonded nylon thread Interior : Closed cell foam dividers, 200D polyester, polyurethane-backed nylex liner, 2x polyurethane-coated nylon 210T seam-sealed rain cover, and 3-ply bonded nylon thread.